Why «Oikosophia», and what does this new and yet archaic word mean? Sophia in Greek means Wisdom, a knowing, or intelligence, which once used to be called “of the heart”: that is to say, an inherently relational, inborn way of being in unison with the totality of the living world, rather than the analytical approach of a discriminating intelligence that reifies. Oikos in Greek is the communal home, and this word has generated the prefix of both «eco-logy» and «eco-nomy». This collection of essays argues that, in order to regain a meaningful connection to our “communal home”, just “caring for the environment” is simply not enough: rather, we need to recover the vision and inner presence that allows us to feel, and to inwardly know, how radically we belong to this home of ours. The wisdom necessary to achieve such a sense of interbeing —our only true being, in fact — is now urgently calling upon us, yet it comes from afar. From ancient Egypt to the Hermetic, Pythagorean, Presocratic, mysteric, Neoplatonic wisdom traditions, the vestiges of this knowing are traceable all along the history of the Indo-mediterranean world. During the first half of the twentieth century people such as G.R.S. Mead, C. G. Jung, R. Schwaller de Lubicz, and H. Corbin clearly saw, and proclaimed, that without a reclaiming of the Intelligence of the Heart there is no future for humanity, nor for our communal home. They therefore promoted the need for an epistemological shift in our perception of reality. Today, indigenous traditions weave this same ancestral message into the ecological discourse, with the same goal of endowing environmentalism with its necessary wisdom-based foundations; hence, their voice too has been included in these pages. In the words of David Abram, one of the most distinguished contributors to the present volume: «We are fully human only in contact, and conviviality, with what is not human», that is to say with the more-than-human living world. Today more than ever we and that world depend, for our survival, on the choices we are about to make. Now. Boccassini, Daniela. 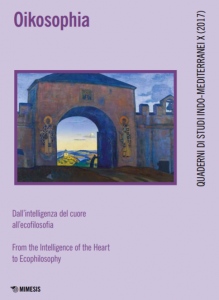 Oikosophia: dall’intelligenza del cuore all’ecofilosofia = from the Intelligence of the Heart to Ecophilosophy. Mimesis, 2018.